He's very affectionately and playful. I adopted him 2 weeks ago from the shelter. I'm posting because I was wondering if his dark feet means he is not a snow shoe? That is just what the papers I got from the shelter say. Editor's note: Thank you for adopting! The only way to determine breed for sure is to have paperwork from a breeder. That is, of course, not possible here. Snowshoes have an inverted white "V" on their faces which gives them a more pronounced mask. As you've pointed out, they also have white feet. So, he doesn't meet that criteria (although I can't say that he doesn't have Snowshoe blood). I'd say he looks more like a Tonkinese. But... it also looks like he's got longer-than-short hair, though, so I'm thinking Balinese (essentially a longhair Siamese but recognized as a separate breed) or Ragdoll might be in there somewhere. I go with a Birman look. We have a Ragdoll that looks very similar, called mitted sealpoint. There are lots of web pages for Ragdolls. 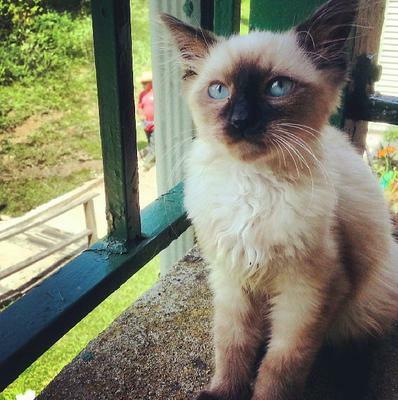 He is a chocolate point (denoted by the dark nose mask and lighter outer mask), not Seal Point and possibly crossed with Persian which would make him Himalayan, a breed to his own. He also has the applehead configuration in that his face is more rounded than a traditional Siamese. He is very beautiful and very lucky to have you. Thank you for adopting. His fur is longer than Siamese fur, so he is definitely a mix, and I'm not so sure about the Color Point. I have a Snowshoe. Look them up online. The comment about the color of the pads is true. Best way to tell the color of Siamese kittens too. Snow shoe cats have white feet. This is a seal point. I got from a breeder a Snowshoe but she does not have white feet she looks like this one. Personality like Siamese, can't pick her up but playful. Snowshoes usually have white feet and white on their face. I would say this is a seal or chocolate point. Look at the paw pads, what color are they? If they are really dark, almost black then it's a seal point. If they are closer to a chocolate brown then chocolate point. >^..^< Adorable kitty in any case! I think this is a Siamese kitty. I have a Snowshoe Siamese and he has 4 white feet and white on his face and chest and belly. I do not think this cat is a Snowshoe. Doesn't matter the breed. He's adorable that is all that counts!!! !